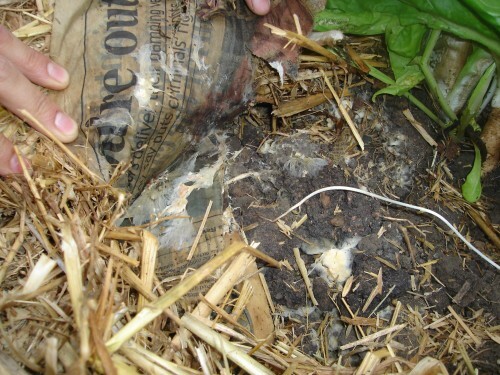 Juanfran is a long term volunteer at Ragmans and he has been carrying out this project alongside his work on the farm. 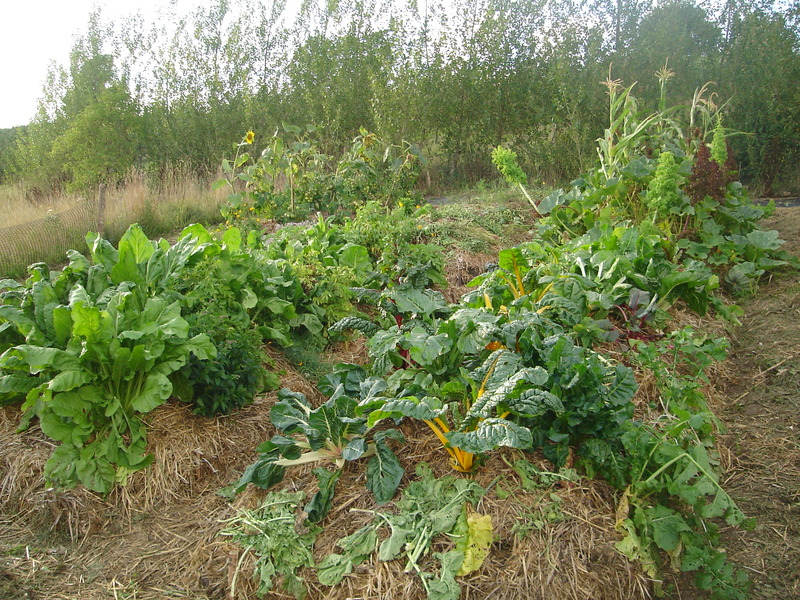 Some years ago, tired of the endless routines of digging, fertilizing and weeding (which I think is useless at the beginning of the season) I began to read about Natural Agriculture. Very different to the usual, scientific approach to agriculture, this reform was pioneered by Masanobu Fukuoka (‘The One Straw Revolution’, and ‘The Natural Way of Farming’). Fukuoka proves that you can achieve good yields when leaving the soil undisturbed, active in its own dynamic and wild state. I began to understand about soil. Then I was left with lots of questions, the most persistent was: Could I improve these techniques in the UK’s temperate climate? This question led me to discover Synergistic Agriculture. Synergistic Agriculture is a method that has been developed since the 1980s by a Spanish woman called Emilia Hazelip. 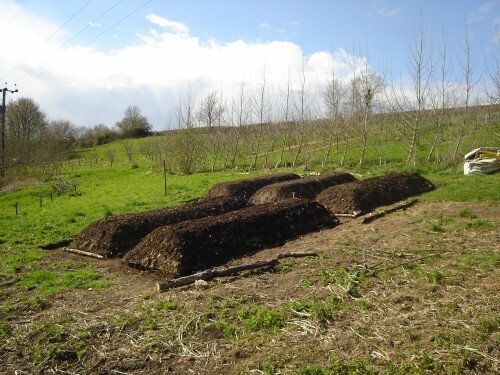 This method allows you to farm without digging or even scratching the soil, not even superficially. This protects the bacteria, fungi and all forms of invisible life allowing complex, subtle and beneficial interactions. Ploughing, or any other disturbance of the soil kills millions of underground and microscopic creatures and prevents organic matter accumulating in the soil. This destroys the living soils activity and all the resulting benefits to crops. In return we have to reproduce the benefits of the natural activity with the “myth” of applied fertilizers. 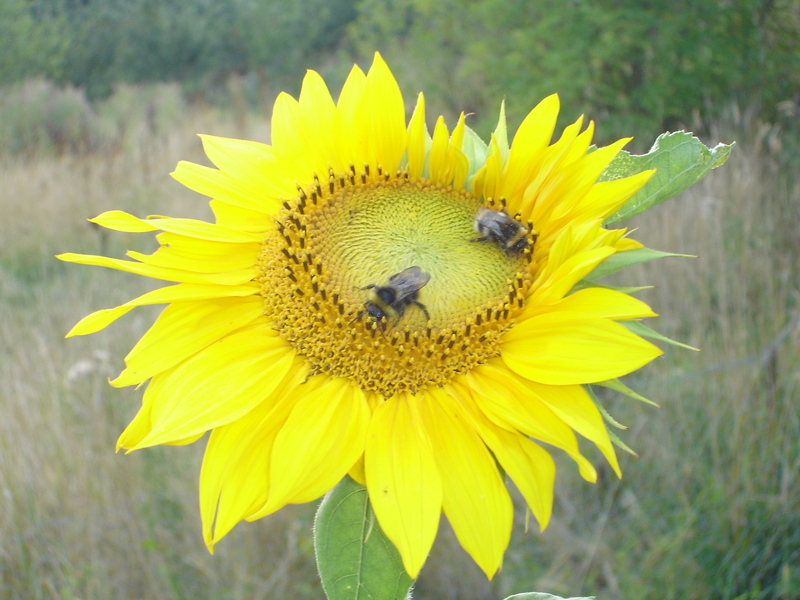 In the natural environment 95% of the nutrients come from the sun and atmospheric gases. – Establish a partnership with symbiotic organisms in the rhizosphere. Synergistic Agriculture is not the same as “do-nothing” agriculture. With Synergistic Agriculture it is important to consider crop successions and companion plants over the years. After examining Synergistic Agriculture in depth, I decided to experiment and make my own raised beds. I made my beds 1.40 m wide, 4m long and around 50cm high with 70 cm between each bed. 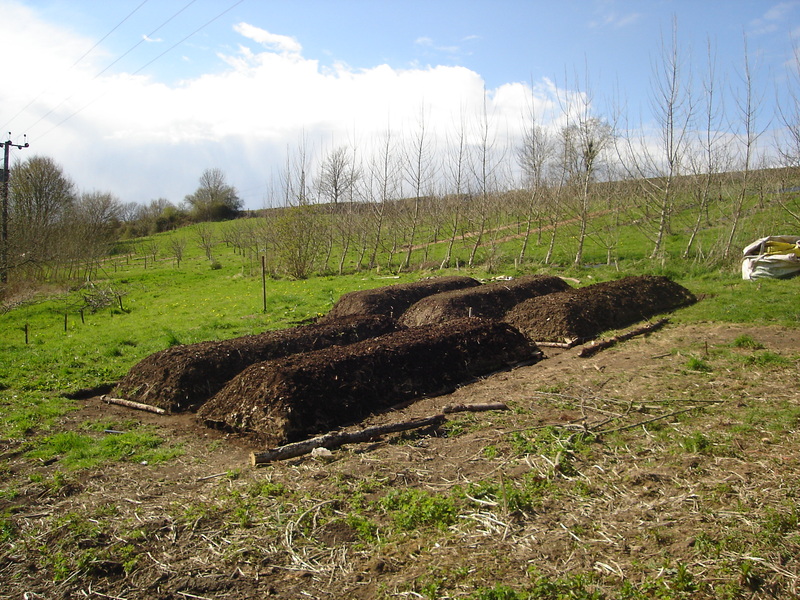 I selected different types of materials to make my “lasagna beds”: apple branches, kitchen scraps, leaves from the woods, ashes, horse manure, compost, 3 years old wood chip, clippings…I found everything around me!! Mindful about the time of year I started (end of winter, early spring), I knew the layers wouldn’t have very long to decompose before I wanted to plant into them. I used around 4:1 balance between brown and green layers, and considered the main needs of my first crops. The next step was to plan the vegetables in each bed. The two main things I had to consider were time and space. The planting had to take account of the time each vegetable needs – to grown and ripen, and the space they would occupy over that time period. My second concern was to replicate a natural balance between the plants grown. I wanted 33% of root plants in each bed, 33% of fruit/flowers and 33% in leaf. Ideally to include one legume per bed for nitrogen fixing. This ratio is not always possible and some element predominates but this can be rectified in subsequent rotations. And thirdly, another basic consideration is the animal kingdom; we need insects in the garden. To meet this requirement each bed must have a minimum of 2 types of flowers and herbs to confuse the possible pests. These act as a biological control, and help keep a biological balance in the garden. 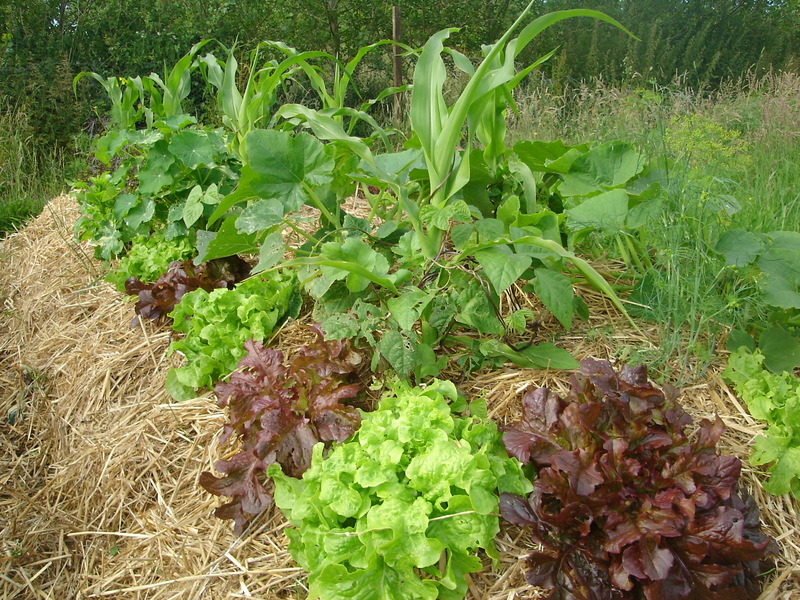 I used straw as a mulch. This was to reduce the need for irrigation, to keep the right temperature in the beds and avoid erosion. The slugs would have a good time in the beds too, but I had a surprise when the ducks began to visit the garden at night time when the slugs visit the vegetables. The beds get a lot of guests including a lot of toads! After one and a half months the tomatoes were climbing up the sunflowers, in-between dwarf beans, celery, cabbage. 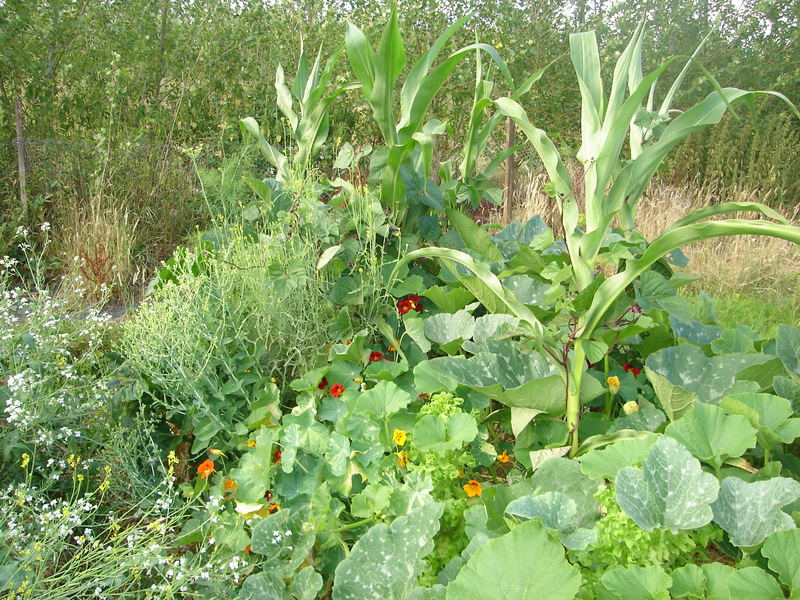 The climbing beans were growing up the sweet corn through a sea of squash. Everything surrounded by salads and onions, potatoes, spinach and peas; with garlic and leeks around the edges; swiss chard, beetroot and peppers with shallots and turnips in the gaps. A food jungle…. so much food everywhere!!! I always try to keep dead plants with live plants, and mix annual crops with perennial crops. Now I notice that the soil is really healthy, a nice structure and full of mycelium. 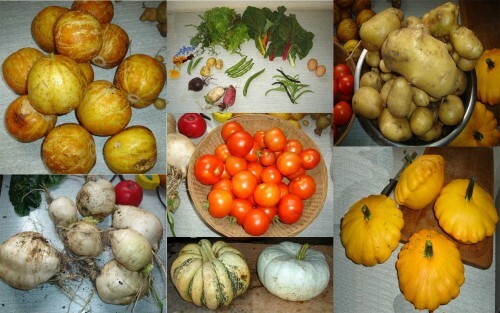 Now as I keep harvesting and planting for the winter, my experience tells me that the only thing, yet the most complicated thing we have to do is “un-learn” everything about conventional growing. Observe, interact and play with nature, not against it! Now all the work is done and I just have to walk around the garden, enjoying, harvesting and eating. Life is Wonderful!!! And remember, the garden is a place to enjoy, not for work; let nature work for you!!! For more pictures, including the process of making the beds, see the Ragmans Farm facebook page. 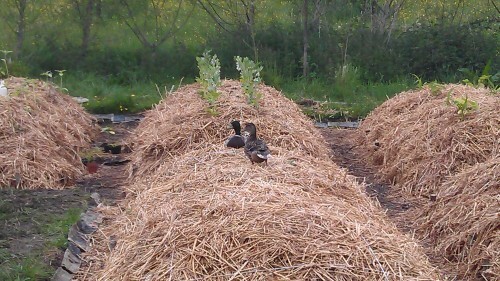 There is a pond in the farm, so the ducks visit the garden every days, just I have to find a way for bring the ducks to the beds. Ragmans Farm is where we hold most of our residential courses. Juanfran’s project is an excellent teaching example. The orchards, where they practice a radical new approach to plant health, are too. And just now the main vegetable garden is being reopend by a dynamic group of young gardeners. It’s a great place to learn about permaculture!